Our achievements are what drive us forward. We are cutting carbon, realising cost savings and improving wellbeing at SCFT and with other Trusts across the NHS. At the heart of Care Without Carbon is our ambition to get everyone thinking about how they can be more sustainable, not just within healthcare but across the board. We hope to achieve this by talking clearly and openly about the work we do, why we do it and what we are achieving. With clarity comes understanding, with understanding comes action. And with action comes change. Our work in 2017, as detailed in our latest Annual Sustainability Progress Report, demonstrates the effectiveness of this principle. We’re proud of our achievements, while recognising that there is much more we can do. Or you can download the PDF here. Our first Annual Sustainability Report was also a first within the NHS. Traditionally Trust’s report on their sustainability work within the Annual Report, but we believe that sustainable healthcare has a bigger role to play in the future of the NHS. That is why we’ve created a specific report on our work to deliver truly sustainable healthcare. You may also view the report here to download your own copy. Our award winning Dare to Care staff engagement programme helps to deliver on the Culture and Wellbeing steps of our Care Without Carbon model specifically, while also supporting across all seven of the steps. 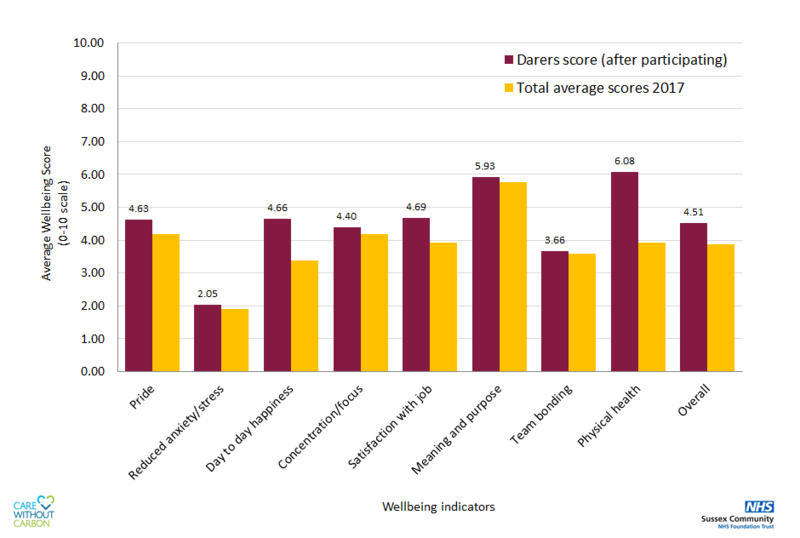 We have worked with NEF (New Economics Foundation) to measure the success of our work with Dare, and we are delighted at the results so far. In 2017 staff engaged with our Dare to Care programme reported an 18% uplift in wellbeing over staff who had not taken part in Dare to Care. This was up on the 12% uplift reported in 2016. The benefits of this are very encouraging. Would you like to see results like these at your Trust? Then get in touch as we may be able to help. Email Will Clark (will.clark@nhs.net) our Director of Environment and Transformation or give him a call on 07867 832071. Care Without Carbon is created by Sussex Community NHS Foundation Trust. By the NHS, for the NHS.